I am asked a myriad of questions that I don’t always know how to answer in the moment, as there are so many possible ways to answer. However, hopefully the following will help answer some of the more common questions asked of myself or my family. Why did we create this Web Site? At first, creating this website began as a way to connect with others through a blogging experience, learn about my injuries and how to have a better quality of life; it was difficult for me to locate my blog posts or keep them organized, so we opted to change it from a “blog format” to a “website format” with tabs and drop-down menus to help me locate my posts easier and make it more user friendly. The website then evolved in a way, to something that made me feel useful in my life again, and helped me keep track of information. Documenting and researching my injuries for myself, helped me realize that others might benefit from the information that I came across, without having to do all of the work to find it for themselves – if they had those same injuries; it gave me a feeling of hopefully being able to continue to make a difference in this world, despite my “new normal” and physical limitations. Sharing what I learn through my recovery journey, self-advocacy, and survival experiences became my way of coping and healing on the inside. Why did we name the Web Site “Hope TBI”? HOPE was the primary thing that has helped me get through life, however this whole life altering event took that word to a whole new level of meaning for me. Before I could get my thoughts together I would see that word hanging in my hospital room and it became what helped me go on when I was feeling overwhelmed. I have always appreciated acronyms throughout my life. As I improved and gained a new appreciation for my life and each one of my senses, I had a lot of time for reflection. I thought how could I help others find HOPE? What would stick? How could I incorporate this word into helping others? So HOPE became “Helping One Person Excel”. Then it just came to me. Through all the help I have received, or haven’t received and whether it was effective or ineffective, it still impacted me and my life in some way. All of the things that had happened and that would continue to happen was all geared to one goal for me….gaining my independence back. Even if that initially only meant being able to advocate for myself medically, or depend on my family to do so. So since I endured a closed head injury/traumatic brain injury (TBI) and that seems to have been a catalyst to a host of changes; how could I marry this whole experience with giving someone HOPE and not lose the essence of where it all began for me. “Help One Person To Excel – To Be Independent” seemed to work nicely. Is the picture involving the Cherry Blossom Trees significant? What do you hope to accomplish with this Site? To provide a place of inspiration, resources, educational information, the opportunity to give others the power to make informed decisions about their care, and to bring awareness to Polytrauma and Traumatic Brain Injury on a global level. This is dedicated to those that are survivors and may feel alone in their recovery. You are not alone! This is dedicated to the healthcare providers or caregivers of anyone experiencing Trauma (in this case, specifically related to MVA injuries sustained by Site Moderator). This is intended to be a place of HOPE. 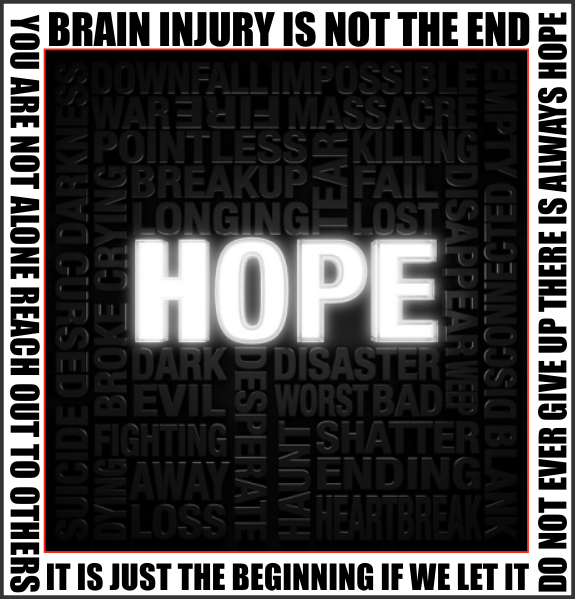 How does HOPE TBI help others? We are available to provide at no charge, assistance locating resources, information, and emotional support to those who contact us requesting such in regards to Polytrauma or Traumatic Brain Injury. We can post your factual story in an online format so you can share your specific link with anyone you choose. Stories are welcome for Survivors, Caregivers, providers, etc. Stories are also welcome to honor those who have died as a result of a Polytrauma or Brain Injury. We support Polytrauma or Brain Injury Survivors with marketing their music, books, personal blogs, support groups, websites, or videos under our Support Groups Sites and Books page by posting a link to their material. We only link to those we have had direct communication with to do so. We also make attempts to reach out to anyone referred to us as well. We bring awareness to Polytrauma and Brain Injury through a variety of social media outlets, emails, phone conversations, and different types of advocacy. We provide a Group called HOPE TBI Co-Op/Exchange that will allow you the opportunity to share your fundraising pages (Go Fund Me, etc), post requests for supplies, offer others/donation of supplies/equipment at no charge, and post medical equipment requests to receive at no cost (no vendors or selling allowed). We provide an online support group called HOPE TBI Support Group where folks can share their questions, experiences, concerns, struggles, various opportunities, ideas, and opinions that give others the power to make informed decisions about their care, advocacy support, and bring awareness to Polytrauma and Traumatic Brain Injury on a global level. How Can I make a Physical or Financial Donation or Contribution to help with keeping this site going? There are costs involved with running a website, requiring or gaining access to research papers, printing, advertising, etc. If you like what you see here and would like to contribute to keeping this Website active and growing, please consider making a contribution. Donations can be made in a variety of ways. If you have further questions on helping to support the growth of this website, or wish to sponsor a fundraising event, please submit your inquiries to hopetbi4ever@gmail.com. Contributions can also be made to another human being who is going through an experience like this. Be supportive, be available, be a listening, be a friend. Learn all you can and help where you are able. Treat others the way you would want to be treated if you were in that same situation. Be compassionate, do what is right – don’t just look the other way. Advocate in ways that are possible. Do we Accept Guest Bloggers/Authors? Yes. Please contact hopetbi4ever@gmail.com with your submission(s)and legitimate demographic information (Name, Address, Phone Number, Email). These may include articles, poems, etc. What Has Changed Since the wreck for the creator of HOPE TBI ? I would say that I am doing better than I was January 4, 2014 (the day of the wreck) when brought into ER, but not as well as I was before then. I would also say that I attempt to remain as goal oriented and as positive as possible. This is a daily endeavor and I do not always accomplish this goal. I would say that the desire to get back what was taken lingers strongly in the forefront of my focus…though my focus is easily distracted nowadays. I would say that it is hard to distinguish between the me I used to be and the me I am now, and I am having to reinvent myself. I would say I have learned to advocate for myself in a much different way than I used to….in every aspect of my life – not just medically. I would say that I am grateful every single day for my life and how I get to wake up breathing and with options of new opportunities. medical breakthroughs, and the healing progress – even if baby steps. I would say that in many ways I continue to embrace my “new normals” with determination. What is the prognosis/recovery time? At first my family was told in 2014 that it would most likely take about 1-2 years for me to be at my medical best as all injuries should be healed by then. That was before we discovered numerous unhealed and untreated fractures, months after the accident. Then I underwent a critical and dangerous surgery 10 months after the wreck for unhealed rib fractures (flail chest from the wreck – requiring plating of ribs 5-10 with 40 locking screws) and the first scapula surgery (as my scapula was still shattered with no healing). This then re-started the recovery clock over. Then additional spinal injuries were discovered due to ongoing pain and physical limitations overall. These were discovered about 15 months after the wreck through an MRI (MRI never done prior by the hospital or anyone – just CT Scans and x-rays). This was all initially confusing to me and very angering – for many reasons. Why weren’t they caught sooner? Why weren’t they treated sooner? Why weren’t basic tests done given the severe mechanism of injuries I sustained? Why wasn’t I listened to as the patient? Why wasn’t my family listened to? The why questions seemed to mount day by day. Injuries continued to be discovered, explored, and treated as time went on (and still do). Then 2 years after the wreck – still with a shattered unhealed scapula and now nerve damage from delayed treatment…..I underwent 3 more surgeries in 2016 to reconstruct my scapula with a bone graft, shoulder, and acromion repair (two in January and one in May)- which re-started the recovery clock over each time. I was then told in 2016 it would now be an additional 12-18 months after the final surgery to most likely be at my medical best orthopoedically. This whole ordeal has been dramatically life changing on every level imaginable. There are new layers to this all the time that continue to pop up. Learning to accept that recovery will not be rushed, will not be boxed in to a certain time frame has been difficult to accept. Additionally, some stubborn and continued injuries have all not resolved. I survived death twice in 2014…..and several times since. I think I have a pretty good head start on the law of averages here for overcoming. Every day above ground is a good day and I am very optimistic about my orthopaedic recovery and looking forward to the continued and amazing rehabilitation of my right arm again! We have some other hurdles to overcome, but this is a great start and strong movement in the most effective direction possible, which in many ways will be….I am coming to understand – will be a lifetime venture. I anticipate I will continue to move forward and healing will move forward with me as well. I look forward to a long productive life. Will I remain in a wheelchair or can I walk? The short answer is I am no longer in a wheelchair since March of 2015 for the most part. I had to learn to walk again. I had to use it again off and on later in 2015 and again in 2016 when travelling to Minnesota for my Orthopaedic Surgeries as unable to walk long distances at the train station and airports, due balance issues, fractures/enormous pain in my back/shoulder and body overall – endurance has been a challenge for sure. I have been out of the wheelchair more now than in it. I do use the electric carts at stores as needed, depending on what kind of day it is for my body. I walk with a cane for the most part now, though am endeavoring to not use it as much over time. I walk at home and in as many places as possible and I am able to tolerate. I am learning where all the “sit down and resting” spots are (and more bathrooms too). I still do need the wheelchair now and again as my stamina varies daily &/or weekly. My personal goal is to eventually be without any assistive devices while maintaining my balance and stamina. I know I will continue to take one step forward and 2 steps backward, but as long as we are still moving forward all is well. Have All My Injuries Resolved? No. I have chronic pain and continual headaches. I still have orthopaedic fracture in my spine as of 2019 that remains unhealed; I have Neurogenic Bladder (which appears I will have for life); I have back injuries (2 herniations, some cervical stenosis, and several bulges); I have had hearing loss requiring a hearing aid, vision challenges I am being treated for, etc. I also continue to deal with memory loss, some cognitive challenges, Depression, and PTSD regarding all my injuries and the adjustment to all that has come with that since the wreck. I am grateful for all the numerous strategies in place that help me move forward each day. What is being done for me? I have had many Physical, Occupational,Speech, Recreational Therapy sessions. Counseling to help me adjust to all the newfound changes and other related “schtufffffff”. I have a Physiatrist (Rehabilitation Doctor), Orhopaedic Group/Surgeons, Primary Care Physician, Neuro-Opthalmologist, Neurologists, Uro Gynocologist, NeuroEndocrinologist, Counselor, Vocational Rehabilitation specialists, and various other professionals working to help me. How has my experience been regarding healthcare providers? I do want to say that I have had some amazing providers who have been a testament to their fields and truly took their oath to “do no harm” seriously. I had some providers who advocated for me – even against their colleagues and the insurance companies and that is how I have been able to recover as much as I have thus far. I have had providers that actually listened, researched my injury, gave us materials to read, or read materials I brought in regarding new studies or articles my family/I found online. I have had amazingly talented providers who made me feel hopeful about my future, or at the very least were knowledgeable and realistic about what to expect. I am very grateful for all the healthcare providers I have had. Even the not so great ones have taught me valuable lessons in self-advocacy. Those that have gone above and beyond on my behalf I am eternally grateful for and words will never begin to express my sincere thanks. To be transparent though, not everything has been smooth sailing. I have also had some providers who dropped the ball in their duties. Some that didn’t listen to me as the patient, or didn’t listen to my family. I had some that were rude, condescending, seemingly worthless with their obvious lack of involvement/care/follow through, didn’t document properly, got tunnel vision, flat out lied in their documentation and either were not educated in current trends, discoveries, and advances in their field – or they just weren’t interested in doing the work required to advance their knowledge outside of their own comfort zones – some of them by their own admission. I have had providers that made major mistakes in my care which have, in some ways, affected the outcome of my recovery still. What am I doing for myself? Allowing myself to heal. I have been focusing on what matters most to me – my kids and family, my faith, holding on to HOPE, educating myself about my medical conditions so I can better myself overall, and learning to advocate for myself differently and more effectively. My ideal vision for myself is being to return to a Vocational Setting that both fulfills me and allows me to make a difference in the world. What do I remember about the wreck? Absolutely nothing! Yes, still! Absolutely nothing………after talking about this numerous times, seeing the vehicle, revisiting the scene of the wreck to hopefully jog some kind of memories, and reading countless medical reports over and over. I am convinced now that this was/is a blessing….not to remember. How is Austin (my then 5 year old – now 10 – Did he get hurt? Austin’s carseat and the seat he was in got damage to it. Austin did not get a scratch or even a bruise. He was in a 5 point restraint in his car seat. However, it has affected him in a deeply traumatic psychological and emotional way. He has had some intense PTSD over this event that he has been treated for. How could it not? Yet this tends to be diminishing to some degree as time passes and he gets older. He still remembers and still talks about it sometimes. Perhaps in time his young mind will forget what his heart will always remember. I often catch myself staring at him, being ever so grateful for my seatbelting skills *wide grin*, his seatbelt assembly did not fail him like mine did me, and I truly believe that he had angel wings wrapped around him that day in more ways than one. There were many miracles that day…..many!!!! How Do You Continue To Cope? I wake up each morning thankful to be alive. I read, I educate myself, I continue to dedicate time to this blog/website and the online support groups which have been and continue to be a Godsend for me. I go to counseling and I advocate for what I believe in. I cry, I get angry, I struggle, I accomplish little things, I accomplish large things, I keep moving forward. I spend time volunteering for various non-profit’s as I am able and my body cooperates. I am getting out in the community more and more. I am buckled right in for this emotional roller coaster of a recovery experience through all of its intricacies. I am learning to accept myself as I am now, radically accept all the nuances that I continue to face and be mindful to love who that Survivor is and who I am becoming throughout the course of my recovery. I mourn the old me less and less as I get to know the me I am now. Life goes on and I value my life too much to drown in this sea of pain and limitation. I will survive.